Stevens grad Bryce Rivers among four players competing for job. Season opener: at Arizona State, Sept. 1, 9:30 p.m.
SAN ANTONIO – It’s not quite mid-August but the anticipation for a new football season already has started to build for the UTSA Roadrunners, who are in their second week of fall camp. The Roadrunners open their eighth season in school history at Arizona State on Sept. 1. The teams have met once before, with the Sun Devils rallying for a 32-28 victory in 2016 at the Alamodome. UTSA is in the unenviable position of opening the season with a new quarterback on the road against a Power 5 team. 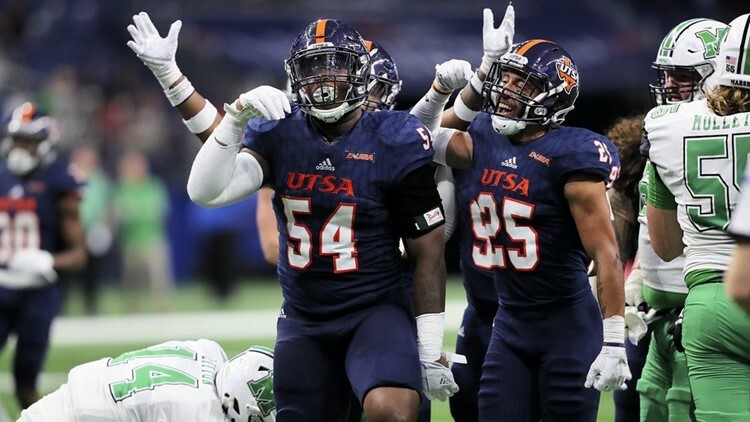 The Roadrunners also must replace defensive end Marcus Davenport, who was selected by the New Orleans Saints with the 14th overall pick in the NFL draft. Steady quarterback Dalton Sturm, who made the team as a walk-on, went on to start 31 straight games before completing his college career last season. Sturm signed with the Dallas Cowboys as an undrafted free agent. Four players – senior D.J. Gillins, junior Cordale Grundy, sophomore Bryce Rivers and freshman Jordan Weeks – are competing to start at quarterback for the Roadrunners. The race is still too close to call, head coach Frank Wilson and offensive coordinator Al Borges said Saturday. “I thought, all in all, all four had some good moments,” Wilson said, referring to how the quarterbacks looked in a scrimmage Saturday morning. “Certainly a lot of work still to be done there. The quarterback competition is one that’s very heated right now. We have four scholarship quarterbacks that are all competing very well. It’ll be interesting once this film is graded. Rivers, a Stevens High School graduate, came off the bench to play in three games last season. Although they lost a heartbreaker to ASU two years ago, the Roadrunners were heartened by how close they came to pulling off the upset. UTSA led ASU 28-25 before running back Kalen Ballage scored on a 2-yard run with 3:15 left to thwart the Roadrunners' bid to beat a Power 5 conference team for the first time in school history. UTSA finally got its historic victory against a Power 5 team last year, beating Baylor 17-10 in Waco. Strong and Tauaefa were among a group of UTSA players made available for interviews Saturday at the team’s annual media day on campus. Wilson, Borges, defensive coordinator Jason Rollins, and special teams coordinator Gary Hyman also spoke with reporters. The Roadrunners went 6-5 overall and 3-5 in Conference USA last year, finishing fifth in the West Division. UTSA went to a bowl in its first season under Wilson in 2016 but was snubbed last year despite meeting the required minimum of six victories. The Roadrunners were 5-2 with four games left in the regular season but went 1-3 in November and didn’t get their sixth victory until their next-to-last game. UTSA returns 36 lettermen, including four offensive starters, six defensive starters, and both kickers from that team. Strong and Tauaefa are back to lead a defensive unit that finished the season eighth in the country in scoring defense (17.0). But new defensive coordinator Jason Rollins faces the daunting task of replacing Davenport, last season’s Conference USA Defensive Player of the Year. Wilson promoted Rollins, associate head coach and linebackers coach the past two years, to defensive coordinator after Pete Golding left the Roadrunners in mid-December to join Nick Saban’s staff at Alabama.